Whether you’re just not ready for an upgrade, or are getting a hand-me-down iPhone 6s, you don’t need an iPhone 7 to feel like you have a new phone. 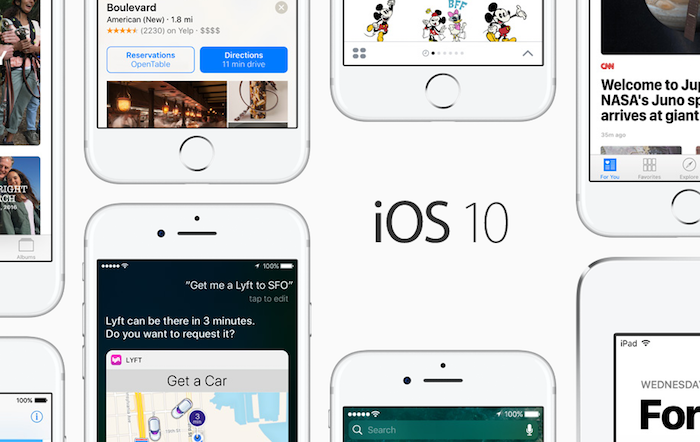 iOS 10 is out now for the iPhone 5 and newer, and it’s a huge update that changes everything (well, almost). Download the free update and your phone will feel fresh, from a new lock screen to sending messages. Check out the best features below. Secret messages, quick responses, and handwritten notes are just a few of the big changes to the Messages app, according to CNET. It got a giant overhaul, completely changing what you can send and how you do it. You can send a “Gentle” text, which makes it show up smaller in the message thread, or chose to make it “Loud” to get your point across. Stickers let you add personality. And if you want something more personal, you can write out a message with your finger and send a handwritten text. The coolest feature? Using invisible ink to hide your message until the recipient swipes to reveal it. The lock screen no longer turns dark when you have a new notification, plus you can add widgets for quick access to apps you use the most, like your calendar or the weather. Notifications are smarter too — you can press and hold them on the lock screen to see more info or reply to messages, says TechCrunch. Apple’s voice assistant Siri can now do more than just tell you the weather or sports scores. With iOS 10, you can ask her to summon a ride through Lyft or Uber, or send a message through WhatsApp. 4. Remove stock apps you don’t want. Hate the built-in Maps app? Now you can delete it. Same goes for most of the stock apps included on the iPhone, like Weather, Stocks and Reminders. But according to Gizmodo, you can’t delete every single pre-installed app, including Phone, Messages, or Safari. If you ever want them back, you can download them again from the App Store. You’ll never again have actually listen to a voicemail. Now you can just read a transcription of the message. They might not be spot-on quite yet, cautions Business Insider, so you might still want to listen to get the full message. When you sent an alarm in the Clock app, it will now tell you when you should go to bed depending on how many hours of sleep you need. It will even remind you to go bed when it’s time, according to Apple. TechCrunch points out that the Photos app is now smart enough to know what’s in your pictures, so now you can search for “dog” or “beach” and it will bring up matching photos. New iOS? Check. Now the next best way to make your older phone feel new again is with a new case. Speck’s CandyShell cases for iPhone 6, 6s, 6 Plus and 6s Plus have military-grade protection in a slim design without any added bulk. They’re the perfect protection for your iPhone, with styles and colors that match every need and personality. On Monday September 19, 2016 if you buy two Speck cases, you’ll get 50% off (excludes CandyShell Clear and CandyShell Clear with Glitter).